When it comes to printing, there are still many people out there who are content with the output of the standard A4 printer. That’s fine, but some businesses are looking to maximize production while cutting back on business costs. If you are looking to do exactly that, it’s worth your while making the leap from the realms of A4 printing and into A3 printing. This larger machine can offer you benefits such as speed, versatility and perhaps most importantly, cost cutting. Never considered the prospect of upgrading to an A3 printer with your startup funding? Well, now might just be the time for you to reconsider, and we’re going to make a couple suggestions which might help you decide. Gone are the days of outsourcing marketing duties to other companies when you welcome an A3 printer into your business. Guarantee a standard of quality that meets your needs every time by having the necessary tools to create your professional marketing materials across the room, rather than outsourcing to somewhere where the production and editing process are out of your control. Make those last-minute edits before that unresolved typo costs you any more than it should with an A3 printer such as the Lexmark c925 model, a colour laser printer that gives you the opportunity to review what you are about print before you finally press ‘print’. Being in charge of the creation of your own content, whether that’s business documents, posters, or any other print-dependant materials, means that you and your team will be much more conscious of the process in which your content is created. This enables a greater sense of freedom and an incentive to experiment with your marketing materials, as the costs and capabilities of printing are clear to everyone with access to the printer. With the capability of managing your own work’s progress, just as you would manage franchise opportunities, it may also interest you to know that unlike with your traditional A4 printer, the A3 equivalent allows you to view the layout of your documents at 100% to ensure that the text on your document is easy to read. Keeping in mind that fonts on A4 images are only printed at 90% in comparison, there is quite an obvious incentive to make the switch to an A3 printer. If you were to consider buying an A3 printer, you will, of course, want to have an idea of how much it is going to cost you, especially due to the technology’s demand generation. Unfortunately, you can find these types of printers available at all different price points. If you have a small budget, clearance a3 printers may only run you about $130. If you have a bit of a bigger budget, however, you can also buy one of the best a3 printers on the market for roughly $5,500. This could be an issue for some. But if you value the ability to shop a variety of price levels, a3 printers are a great piece of technology. Whether you’re looking to reduce the amount you print by spreading two potential A4 documents over one A3 print to make keep as much business information in one space as possible, or make materials such as posters and banners all the easier to create, an A3 printer is the ideal addition to your business. Alongside this, you can utilize all that extra office space provided by A3 to create enticing promotions all without compromising on the quality of print. The burden of your printing workload or document management system can also be lightened with the adoption of an A3 printer, which takes advantage of having more power and greater cartridge capacity when compared to your standard A4 printer, allowing you to print faster, for longer. 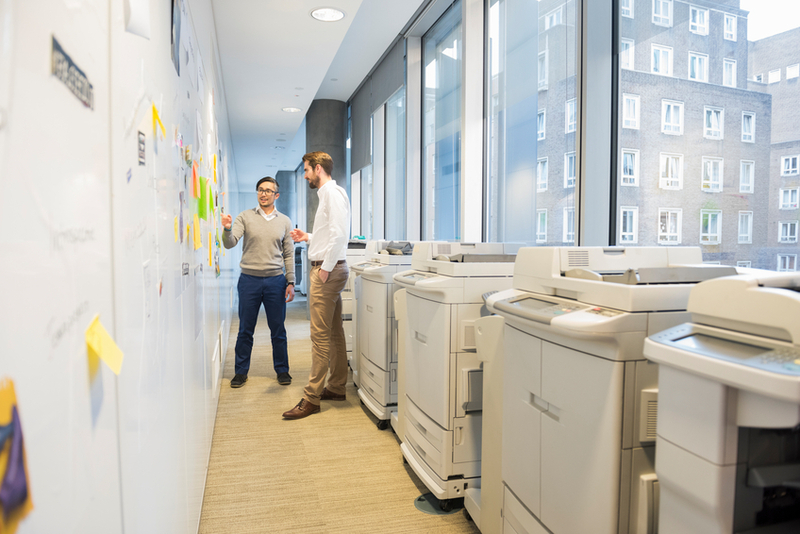 If you want the best of both worlds, our suggestion would be to look at the Xerox Phaser 7100DN model, which supports both A3 and A4 printing, giving your business the ability to choose which print size fits each of your documents.